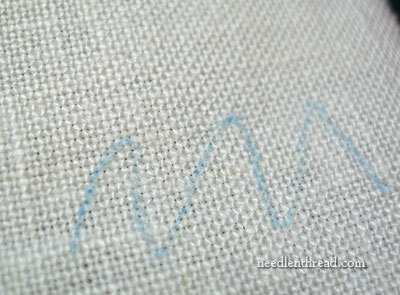 Yesterday, we looked at a quick and simple solution for transferring hand embroidery designs to fabric. The whole question of design transfer is a curious one – it seems that most embroidery folks have their favorite ways to transfer embroidery designs to fabric, and pretty much, they stick to them. I can only claim this to be true occasionally for me. I’m always on the look out for other solutions to the design transfer question. There’s an obvious corollary between the precision, visibility, durability and removability (or hide-ability) of the design transfer and the successful outcome of any hand embroidery project, so I think how we transfer our designs is an important question. Also, the ease and surety of any method of design transfer tends to influence especially beginners – if the design transfer problem is difficult to overcome, it’s easy to lose heart and give up on projects that would otherwise captivate us. So, here’s a product that I’m currently testing to use for embroidery design transfers, especially for whitework. It’s a chalk product, so I’m not 100% certain it’s going to be Just the Thing. But I’m going to give it a try! This is Bohin’s chalk liner set. It includes 8 white chalks and 8 colored chalks that you can insert into the clickable pencil and write with. What attracted me about them is the fine tips on the chalks, the white chalk (for dark fabrics), and the two colors of blue, which may work for a whitework design transfer solution. Incidentally, the chalk liner sets are marketed for quilting and sewing. Because they are chalk, my concern for their use as an embroidery design transfer medium is that the chalk line may easily wear off. The thin little pieces of chalk insert into the “claw” at the top of the plastic pen-like holder, just like any mechanical chalk holder. The line with the lighter blue chalk is quite clear and fine, so that’s a good thing. I rubbed my finger over that a few times, just to see if it would disappear and it didn’t. That’s also a good thing. On the other hand, a few brushes of the finger are not quite the same as prolonged exposure on a frame or use in a hoop. So, a little more use is definitely required to see whether or not the lines will withstand the test of time. The collection comes with a standard pencil sharpener. This is helpful if you’re not too concerned about maintaining a fine point. It takes quite a bit of sharpening to get the chalk to a rather dull point, which isn’t too useful if you want a fine line. The best bet for achieving a sharp point on this type of chalk, I think, is to rub the point down on scrap paper, or to use a sharp knife or fine emery board and hone the chalk to a decent point. You can see in the photo above the dark blue chalk line, too. I prefer the lighter blue, but the dark is nice, too. I can see how these chalks would work really well in sewing or quilting, where the lines are not necessarily needed to endure for a long time. Not quite sure about embroidery designs, but I’m definitely going to give it a try, and I’ll report back to you. I found this at Anita’s Little Stitches, by the way, if you’re looking for something similar. She carries an incredibly thorough line of Bohin products (including all their needles, and many of them in bulk), so I was happy to find her! Have you had any experience using chalk-type products for transferring hand embroidery designs? Any recommendations? What products do you use to transfer your designs, in general? Do you stick to one method of transfer, or do you use different methods depending on what you’re working on? Would love to hear your take on the whole embroidery-design-transfer question – it’s an excellent topic for sharing advice and ideas! Feel free to leave a comment below! My favorite transfer method is by far STICKY FABRI-SOLVY . I don’t have a light box and struggle tracing in the window so this is the product for me. It stays on no matter how long it takes you to embroider the project and it washes off great. I LOVE IT and would highly recommend it. 🙂 It comes in 2 sizes, 1 that fits in the printer and a bigger sheet too. I have used this chalk in quilting, I didn’t like it. With the movements of my hands quilting it would rub off and if it didn’t rub off it would smear. The sharp points would wear quickly and you are constanly sharping them. However I do use it when sewing garments for marking dots. I have used chalk before for transfering. I have never done anything so large that I couldn’t take it with me, and I tend to tote my handwork around with me. Chalk never stood up well. In the past couple of years I have taken up tatting and knitting. I find them more totable than my embroidery. Now I leave my embroidery for home and don’t tussle it about. I am interested in the Bohin chalk and wait to hear how your experiment turns out. I recently got a chalk mechanical pencil made by bohin. It has a very fine point (0.9 mm). It is good for free handing small designs on fabric and for putting on direction lines for silk shading. I also used in a small design I pricked and pounced. Instead of paint or pen I used the chalk pencil. The design stayed long enough for me to complete the piece. I used it few years ago, but I couldn’t keep the tip sharp enough. The pencil sharpener is not adapted for the size of the chalk pencil, the hole is too large. I used it to mark the seam on the fabrics for crazy quilt, I now use the blue washable felt pencil. It works very well. For embroidery I would better go for the sewline pencil. It makes a very constant thin line. It is better to cover it with your thread because it is not easy to remove it. I agree. It got dull too quickly for my preference and I hated stopping all the time to sharpen it. Due to things I’ve heard, I’ve always been careful to completely cover the line when using any of the colors other than the lightest blue. I used a similar set up from another company for quilting. The blue did not last anytime while I was quilting so had to remark a partially quilted quilt. Major hassle! I used the orange and had to wash, wash, treat with stain remover, wash again and most of it came out. The chalk dulls easily and I couldn’t ever get a sharp point again. It is a wonderful idea – just falls short in use. I love this topic and am curious to see how this product works out. I use a lightbox and the blue water soluble markers but am not satisfied with this for more fine detailed designs. It is difficult to keep the fabric from stretching or moving which is why I have yet to use my Micron markers. The soft lead transfer is one I will try! Thanks!!! 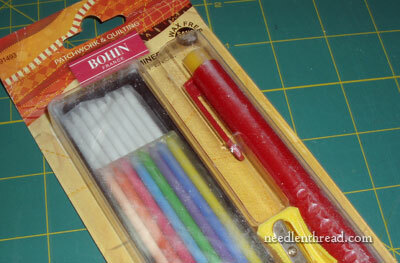 I have tried a similar Bohin chalk marker for quilting. The problem that I had was that the mark did NOT come off, as they promised it would. I have used these for quite a while and just do not even look further. Altho’ I am not an experienced long time embroiderer I find these work well in small embroidery hoops. With all the turns and moving the fabric I have never had to remark. Just one person’s take on the Bohn pencils. 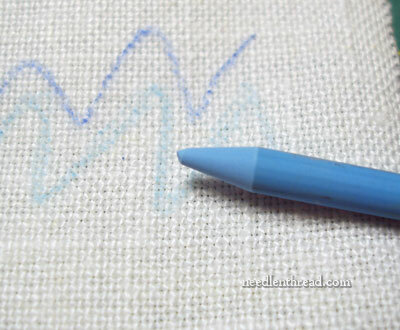 The blue chalk pencil is my favorite way to transfer designs in my “French Handsewing” projects — fine handsewing is a better term (or Madiera embroidery). Usually whitework on batiste. (It has to be washable and intended to be washed.) The “trick” I was given for making sure the chalk stayed put while you were working was hair spray. My teacher had us use a men’s hairspray (generally less fragrance and additives) to spritz over the chalked design. It held the chalk onto the fabric and washed off very easily. It also slightly stiffened the fabric while embroidering (batiste can get wobbly!). My can of hairspray has lasted years and years (you don’t use very much!!) and works like a charm! I use hairspray on my graphite pencil tracings, but never thought about using it on the chalk. That might have helped the marks on my Beverley Sheldrick reticule stay put until I got all 8 motifs embroidered. Good tip! I am a newbie to hand embroidery, Mary. I cross stitched a bit when I was younger but now that my nest is empty, I’m pursuing hand embroidery as well. Your site has been invaluable! Not having a light box, I haven’t attempted a hand transfer yet. I plan to try the single flower you posted recently on my window using a micron mech pencil. Its clear lines and uncomplicated design encourage me. I have two transfer methods that I use most often. One is to trace the design onto net and then retrace the design with the net pinned to the fabric. There is a little bit of distortion with this method and I have to reinforce the design once the net is removed, but it is quick. I can also use whatever marker or pencil is appropriate to my purpose and my fabric such as permanent marker or pencil. The other method I use is a variation on the light box method. I use a black marker to transfer the design to clear acetate, like that used as page protectors, then place the fabric on a light background (or window) and trace the design. I also use the tracing paper method when I have a very fine detailed design, but not often as can’t see what I am doing that way. I know that the pounce method is supposed to be the best but it seems like so much fuss. I think that would be the best option in a workroom when you need to make multiple copies of a design. I have not used the Bohin chalk pen but, I have used their ceramic pencil and it is quite good. However, my two favourite methods of transferring are using a light box and using a Pigma pen for light coloured fabrics and the prick and pounce method for dark fabrics. Mary, I like to use a 005 fine point pigma pen with my lightbox for transfer. I must admit it requires a very steady hand as that ‘archival’ ink does NOT wear off. However, it stays put during the process of completing my project(which may take months!). Looking forward to your evaluation of the Bohin chalk and where to obtain it. BTW, this is my first post ever on your board (on any board for that matter) and I hope I’m doing it correctly. I finally felt comfortable enough to join in the conversation with your thoroughly enjoyable and stimulating news. Thanks for the pleasure. I second the hairspray. There’s also a product called spray fix that’s used by artists to help reduce smudging and smearing when working with pencil. Also found at art supply stores is a great (but a little pricey) sharpener called a “pointer” for sharpening leads in architect’s mechanical pencils. You can also find little metal mesh squares which are rough and used to “point” lead and charcoal pencils. Way cheaper than the pointer but effective. if you haven’t already. I bought it at my local quilt shop and the owner said that she had very good feedback re: clarity and removal. I’ve used this with great success. It has always come out for me, whether on cotton or wool (I used it on dark wool felt for a beginner embroidery teaching piece). The line is thin but it is a bit deceptive. As the lines are drawn they’re clear and as they dry they turn white. The first time I used it I kept going over the line thinking the pen wasn’t working. It was, I was just too impatient and ended up with a thick line. I believe that if you leave the project in a hot place (car or attic for example) and the lines disappear, you can put it in a freezer and they reappear. I don’t recall seeing anything about washing out the ink to totally remove it from the fabric. 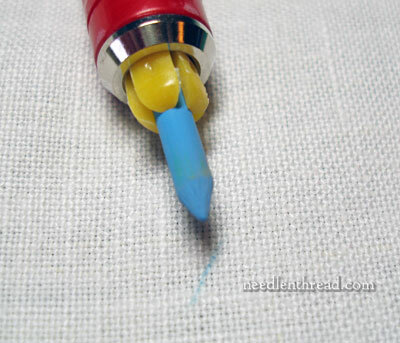 I have been using a frixion pen for marking my embroidery designs (and applique also). The lines are fine and disappear with friction. Or you can heat them and they disappear. Stores where I have purchased them recommend using an iron for the heat to get rid of the lines, but I use my hair dryer! The lines disappear, and I don’t smush any raised embroidery. Hi – thanks for the feedback. I will defintely try this pen. I only have one in purple – I know there are at least six different colors. I have not tried this particular Bohin product, but in general tend to like their products. But I love love love Sewline markers. Their pencils are like mechinal pencils (therefore a very fine line), come in various colors, erase with an eraser and haven’t let me down yet. I love the sewline air erasable marker with the roller ball tip. I find it perfect for drawing lines directly to the fabric as I stitch. I also like the bohin ceramic pencil. For designs that will be completely covered my preferred method is dressmaker’s carbon paper. I have a Sewline ceramic clutch pencil too, and I really like it, although I haven’t used it to transfer a large design yet. After Mary’s advice re air-disappearing and water-soluble marking pens I have stopped using them altogether. The last thing I want is for the lines to come back after the piece is done and given away or sold. I haven’t had direct experience with this product but I have seen some commentary on a blog by one of my favorite professional art quilt designers. She used the yellow on black fabric and actually had the opposite problem – she couldn’t get it off once she was done with it. You are supposed to be able to sort of brush it away or remove with a bit of water – that’s how the quilting folks would use it. So I guess I would be cautious and plan to cover whatever marks I made with it. I have used these Bohin pencils for Sashko and they worked fine although I only did one block at a time. I have only seen them in white, the colours could be good. Another product for marking is a Frixion pen. Apply heat eg hair dryer marks disappear. For quilting, I only use chalk lines if I am drawing them as I quilt because they will dust off or smudge and I would rather use tear away paper than redraw the lines. For embroidery, I use sewing tracing paper and transfer by drawing over the designs with a pen. I also use my sunroom tabletop as a light box and draw over designs onto the fabric with washable Crayola colored pencils. These wash out and lines stay in place and are readily available in many colors, since we end up having to buy them every year for the kids to go to school. I have enough to last me a life time and decided to use what I had, although I do also use my Fons and Porter ceramic lead pencil as well if I need a really fine line. as mentioned by some others, the chalk doesn’t always dissapear after washing my quilts, so I don’t use it very often. and the pencil is also too thick to use it with a quilt stencil. I’m very interested in your researh as I’m doing a lot of cutwork and would like something to stay long enough to finish stitching but will wash out when I’m finished. I tried using the blue chalk tranfer paper put out by DMC when embroidering a monogram. It smeared easily for one thing. Then it was a race to get all the letters outlined before it wore off and it faded fast in strong light. I’m at a stand still as what to use right now. I have used the Bohn pencil in white in quilting and it lasted long enough to get the stitching finished. I am marking as I go and as I look back at some of the stitching I did a few weeks ago, I can still see the markings , not as intense as when first made but still there. This should wash out when I’m finished quilting. Have considered using the blue on scrap fabric but haven’t done so yet. Wil have to do it along with you. well I purchased this same set early last year after an instructor had one and I loved the ease of use. my problem has been getting the markings to come off. I had been using the green chalk (don’t know why I chose green, just felt like it) to mark white cotton fabric that I was doing machine embroidery on. Well, I had to resort to using a Clorox bleach pen to get it out. Other people swear that they love it and they can get the marks out easily, but I have also found a group of people that have the same problems I have. My only thought is that they may use different suppliers that utilize different formulas for the chalk and that is what causes such a drastic difference in result. 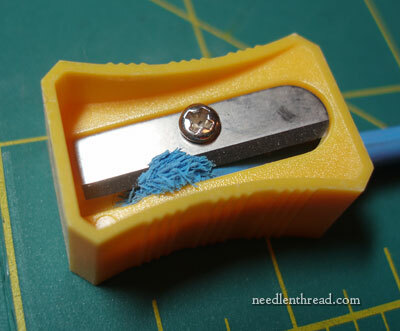 I do use this but in sewing only. With some of these the chalk can “drift” and get on to your thread. Be careful not to let your hands spread the chalk and don’t press too hard as it may not come out when you are done, leaving a permanant stain. I have one of those and they are fabulous! I love them! I have a set of these chalks. they work well for quilting as you don’t need to have a very fine line. i have not been able to get a realy sharp point on them. i think they would not be very good on a fine lined design or something very intricate but would work well for a larger spread out design such as vines. I tend to stick with the prick and pounce method. It is quick, works well on all types of designs and fabrics, and I never worry about staining or residual lines. I print my design on heavy tracing paper with my inkjet printer, prick the design, and pounce with charcoal for light fabrics and baby powder or corn starch for dark fabrics. Then I go over the lines with a mechanical drafting pencil. The chalk pencil looks interesting if it stays on and it works it looks like it would be a good way to transfer designs. Thanks for sharing this with us Mary.